Đoan Trang: The failure of ASEAN leadership? CANBERRA, Australia – It was a packed auditorium – a surprisingly gentle and curious audience at the Australian National University (ANU) looking for reasons to be excited about the Association of Southeast Asian Nations (ASEAN), a 10-member grouping of more than 630 million people that represents Australia’s 2nd largest trading partner. Yet, Vietnamese career diplomat Le Luong Minh, who took over the leadership of ASEAN last year, couldn’t help but disappoint them because in many ways he represents much of what’s wrong with ASEAN today. ASEAN Secretary-General Minh opened with a speech that did little to excite the audience. He focused on ASEAN’s 6 pillars when it was formed in 1967 and its most ambitious project since then – creating one regional economic grouping, the ASEAN Economic Community (AEC) slated to come together by December 2015. Someone asked about tensions between Australia and Indonesia, ASEAN’s largest member, over asylum seekers and recent wiretapping charges from NSA classified documents. Minh was safe, uninspiring and bureaucratic. ASEAN insiders say it’s the luck of the draw, and that the rotating head of ASEAN moves from a politician like former Thai Foreign Minister Surin Pitsuwan, who can inspire outside interest, to a bureaucrat who can set the ASEAN house in order like Minh, who was Vietnam's Deputy Minister for Foreign Affairs. From 2004-2011, Minh was Vietnam’s Permanent Representative to the United Nations. Unfortunately, he's also ASEAN's least likely salesman. Yet, it’s an exciting and dynamic time when a single, liberalized ASEAN could boost investments significantly. There’s also an opportunity for ASEAN to provide much needed leadership at a time of shifting geo-political power. ASEAN is at a crossroads. Created at a time of global dominance by the United States, times have changed – with economic power shifting to China. Instead of taking leadership, ASEAN is in danger of becoming a low-intensity proxy battlefield. This leaves an opening for Australia, ASEAN’s 1st dialogue partner. I’ve been reporting on ASEAN since 1987. I was there in the late 1990s when Cambodia, Laos, Vietnam and Myanmar were admitted in the grouping, creating a three-tiered system because these economies lagged far behind original members Indonesia, Thailand, Malaysia, the Philippines and even more affluent Brunei and Singapore. Like many Asians, I hoped constructive engagement would be a different way to push reforms, more effective than the confrontational push from the West, but decades later, constructive engagement remains an excuse – a failure of leadership. Reforms in Myanmar, the main focus of constructive engagement, were fueled by an internal process – with little help from ASEAN. During the financial crisis of 1997, which started in Thailand and spread to Indonesia, the nations turned, not to ASEAN, but to the International Monetary Fund (IMF). When smog and haze from forest fires in Indonesia that same year engulfed cities in Malaysia and Singapore, ASEAN proved incapable of working together to prevent this near-annual event that continues to plague the region today. In 1999, ASEAN was criticized for failing to hold Indonesia accountable for what was effectively a scorched earth policy in East Timor. Leadership then came from Australia, which led INTERFET, an international non-UN peacekeeping force. In the late 2000s under pressure from some members, ASEAN formed a human rights body that’s stayed largely silent on ongoing human rights violations within ASEAN, like in Vietnam or the Rohingyas in Myanmar. Dealing with China clearly shows the fissures inside ASEAN. At the July 2012 meeting in Cambodia, conflict erupted openly. For the first time ever, the foreign ministers failed to agree on a joint statement – with Filipino officials storming out of the meeting. Other ASEAN states accused host Cambodia of working against ASEAN interests by protecting China, Cambodia’s largest trading partner. Two months later, Cambodia announced $500 million in new assistance from China. While largest nation and founding member Indonesia tried to use shuttle diplomacy for a satisfactory agreement, ASEAN again fell short of leadership. Still, Australian officials seem optimistic. 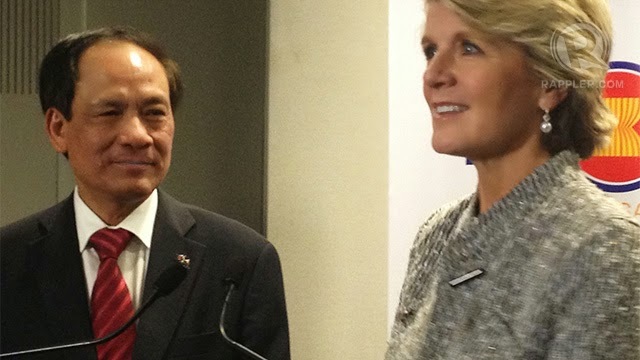 On March 19, Australian Foreign Minister Julie Bishop hosted ASEAN’s Secretary-General Minh for the 40th anniversary of a partnership that she says, now prioritizes trade, investment, regional security and education. The problem lies in two areas: ASEAN makes decisions based on consensus, unwieldy in today’s fast-moving world and in an organization that spans a wealth gap from Singapore to Laos; and that wealth gap leads to differences in leadership experience and style. Cambodia, Laos, Vietnam and Myanmar tend to have fewer officials capable of participating fully in meetings held in English. The most progressive of these nations, Vietnam, used government money to train a new generation of foreign service diplomats like Minh. Still, the skills needed for consensus-building are not enough to inspire faith in the ASEAN way, and senior officials who have led ASEAN, with few exceptions, have not had the charisma or status to demand necessary meetings with heads of states. To effectively push forward an ambitious ASEAN agenda of one market, ASEAN must move faster, and its leader must lead – not just within ASEAN but among its dialogue partners and potential investors. ASEAN Sec-Gen Minh is trying to fill a tall order, and insiders say his experience is helping build the organization behind the scenes. At ANU, he said he’s optimistic that the economic integration of ASEAN, which promises a single market and a highly competitive region, will happen as scheduled in December 2015. “ASEAN has implemented about 80% of all the measures,” he told the audience at ANU. “We’ve got to be realistic. I cannot see that this is going to happen,” said Professor Andrew Walker, Acting Dean of ANU College of Asia and the Pacific.